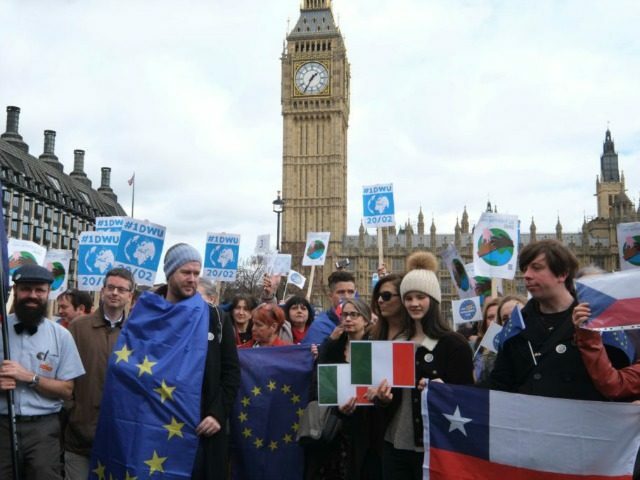 The bill empowering May to start the Brexit process has already been held up by a week after peers voted on March 1 for an amendment guaranteeing the rights of European citizens living in Britain. Members of the unelected upper chamber are on Tuesday expected to back a second amendment, this time to give the parliament a vote on the final withdrawal deal and any future trade ties with the European Union. May has promised lawmakers a vote on a “take it or leave it” basis, meaning that if they reject the deal on offer, Britain would leave the EU without any agreement at all. But opponents of this fear it would cause economic and legal chaos, as all previous trade deals and contracts between Britain and its 27 former EU partners would become void overnight. A poll released Tuesday by the Independent newspaper found that only 25 percent of British people would support leaving the EU without a deal, with 56 percent favouring other options at odds with May’s plans. May has repeatedly urged the Lords not to amend the two-clause EU (Notification of Withdrawal) bill, saying it is designed only to implement the June referendum vote to leave the bloc. She is under pressure to pass the bill quickly to meet her deadline of triggering Article 50 of the EU’s Lisbon Treaty, which would start the two-year process of exiting the bloc, by the end of March. But a Lords source from the opposition Labour party told AFP it expected to win its amendment “handsomely” on Tuesday thanks to cross-party support. The start of the Brexit talks will loom over this week’s EU summit in Brussels, which May will join for the first half before leaving her fellow leaders to discuss their future without Britain. EU leaders have signalled that the upcoming negotiations will not be easy, amid fears that other member states could follow Britain out the door. May is optimistic she can get a deal, but has also warned she is willing to walk away from the negotiations, saying that “no deal for Britain is better than a bad deal”. Her spokesman said this position risks being undermined by the Lords’ demands on a final vote. “We don’t want a process that incentivises the EU to offer us a bad deal in the hope that it stops us leaving,” the spokesman said. However, Labour’s Brexit spokeswoman in the Lords, Baroness Dianne Hayter, said: “We need the best possible deal to lessen the social and economic aftershocks of the referendum result. Peers voted by 358 to 256 last week to amend the bill to ensure ministers protect the rights of more than three million European citizens liviing in Britain after Brexit. The change dashed May’s hopes of securing approval for the bill this week, as it must now return to MPs in the lower House of Commons for deliberation, likely on March 13. Ministers will seek to overturn the change and, with a majority for their Conservative party in the Commons, are confident that this can be achieved. The second amendment on a final Brexit vote, however, might be harder to remove as reports say up to 20 Tory MPs might rebel against May to support it. One of them is Anna Soubry, who said a “proper vote” on the divorce terms was crucial. “If we are faced with a potentially catastrophic ‘falling off a cliff’, the least we can do is provide a parliamentary safety net,” she wrote in the Mail on Sunday newspaper.